I used to run several photography workshops every year, and I'll be honest and say they would all blur together into a mass of early mornings, long drives, and too many restaurant dinners. 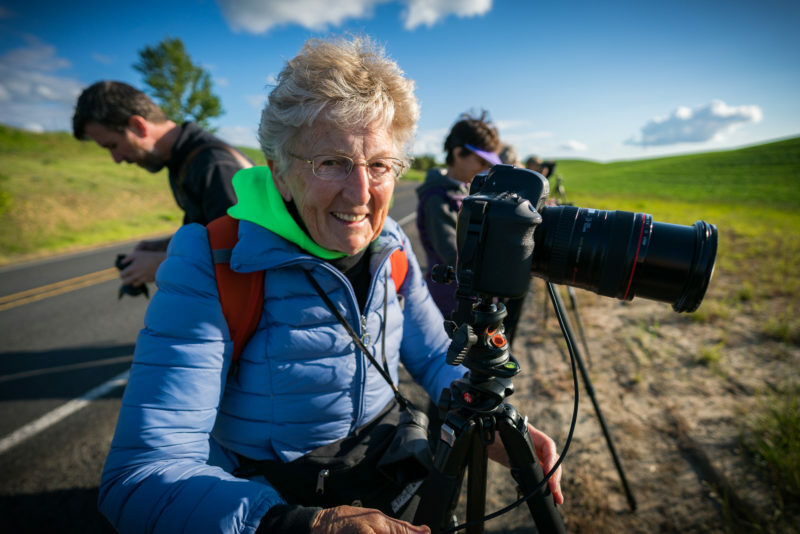 I've lightened my load and now I only offer one workshop each year and this year's excursion was wonderfully relaxed, fun and filled with wonderful people making great images. For many of my clients, this was their fourth trip with me. I am proud to have so many friends who return year after year to explore new places with me. These workshops have taken on the feel of reunions and I love seeing the connections between people grow stronger each trip. This year we set our sights on The Palouse region of Eastern Washington. I grew up in Spokane, and my father's side of the family hails from the rolling hills of the Palouse, so for me it was especially thrilling to be headed home after many years away. The Palouse has become a real global landscape photography destination, and for good reason. The rolling hills covered in wheat and other crops make for compelling compositions and the historic barns are icing on the cake visually. We began the trip in Portland, where my friend and fellow workshop leader Jeff Carlson, picked up the group in our Mercedes Sprinter van. I love traveling together as a group and the big Sprinter gives us a perfect home base to operate out of for the week. 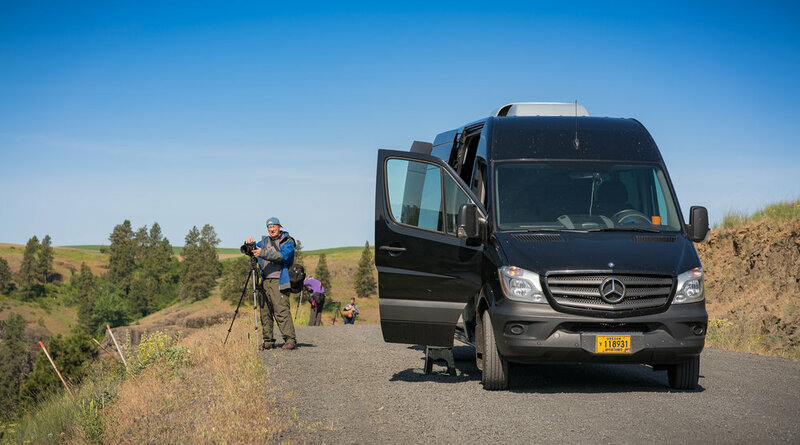 The Sprinter we use is outfitted with a separate secure storage area in the back where we can carry all of our luggage, camera bags, tripods, cooler and all of the other gadgets I like to bring along. Up front we have seats for all 12 of us. We set up the TV set in the van to receive signals from our iPads and Jeff uses the screen to demonstrate processing and show off images as we roll along. It's a pretty sweet setup. From Portland, we made a quick stop at Multnomah Falls. In my workshop two years ago we stopped at the iconic Oregon landmark, but it was late fall and the falls was merely a trickle. On this stop we found the falls flowing nicely, but so was the rain so after some images were made, we hit the road for Hood River where we had lunch at a local brewery, (like one should when in Hood River), then went down to the riverside to grab some great coffee at Stoked before I sat everyone down for a geology lecture. I firmly believe that great landscape photographers should have strong understanding of the natural history of a place and the Palouse is a geologic marvel. In fact, the entirety of our voyage from Portland up the Columbia River Gorge to the Palouse takes in scenery shaped by a series of cataclysmic floods during the last ice age which shaped the land into the spectacular scenery we would be photographing. It seemed only right to get everyone briefed on the how behind the wow. After the long drive up the Gorge and into the Palouse, we dined at a wonderful southern food restaurant in Waitsburg and settled into our small, incredibly charming historic hotel in Dayton. In the morning, we enjoyed a casual morning exploring the town, which could provide enough photographic opportunities for several days. As my clients roamed the streets of Dayton, I sat down for coffee with Nick Page, who is an amazing landscape photographer, workshop leader, podcaster and genuinely nice guy based in town. I've been a fan of Nick's work for some time and after friending him on Facebook we hit it off and I was honored that he wanted to chat and share some of his favorite spots. I wish I could say that all photographers, and all photography workshop leaders, were friendly, cooperative and gracious people. The truth is many are, but many are shitheads who refuse to share locations and actively discourage friendly discourse. Nick Page is the opposite. He gave up all of his secrets and I can honestly say that he helped make my workshop better. He's a prince, and I encourage you to follow his work and join him on a workshop if you get the chance. That evening, we drove up to Palouse Falls State Park to photograph the sunset over the amazing waterfall and canyon. We enjoyed a picnic and a casual field lecture on sunset shooting before spreading out to capture the scene. I took an opportunity to send up my DJI Phantom 4 drone for some video and still images, but flying over the deep canyon stressed me out as swallows kept swarming the drone. For the sunset I lined up with everyone else on the rim of the canyon (gulp!) to make panoramas. The sunset was nice, but the cloud-free sky failed to put on a show so we headed back to Dayton after the Blue Hour. After another nice night's sleep in the cute-as-a-button Weinhard Hotel, we packed up and headed north toward our next base of operations, Colfax. Along the way we stopped to photograph the awe-inspiring wind turbines that now line many of the ridge tops of the West. I find the big towering turbines incredibly fascinating and while I wouldn't want them in every landscape shot I make, I do appreciate their clean contribution to the power grid and they make for some very interesting shots. In Colfax, we hit the local lunch hotspot and then settled into our spartan hotel. Normally, I seek out unique and charming accommodations for my clients, but Colfax is devoid of any such places so I elected to use the hotel that provided the best comfort and convenience. The hotel in Colfax was just fine, but it ranks as the lamest place we've stayed on my trips. As I unpacked to the sound of semi trucks motoring by outside I longed for the Victorian funkiness of the Weinhart or the forested serenity of the Trinidad Inn, where we enjoyed a week of comfort during last year's adventure in the Redwoods of Northern California. We didn't come to Colfax to sit around bitching about the hotels, so we grabbed a picnic dinner and headed to Steptoe Butte for the sunset. During dinner in the lovely little picnic area at the base of the butte, I gave the group my tripod lecture. I have a thing for tripods and I am forever pushing people to get good ones. With that behind us we drove up to the top of the butte, which rises 1,000 feet above the farmlands around it. Steptoe really is amazing. For photographers, it's the best spot to take in the miles and miles of rolling hills of The Palouse. As the sun drops in the sky, long lovely shadows stretch from the green hills, creating wonderful patterns. From the butte's summit parking lot you can shoot in any direction and find compelling compositions. In our time in the Palouse, we shot two sunsets and two sunrises from the location and I could have shot from there 10 more times. After sunset we drove back to Colfax for a very short night's sleep. At 4 am we were back in the van headed back to Steptoe for the sunrise. Back atop the butte we found a number of other photographers set up for the sunrise. As my clients worked the morning light, I set up a table and my trusty stove. Within minutes the sweet sweet scent of brewing Stumptown coffee was drifting across the summit, which caused a lot of turned heads and muttered comments. I won't lie and say I didn't love yelling out, "Hey, my group! Coffee's ready!" Someone suggested that I should put up a sign with my name on it as advertising for my workshops. I shrugged it off. "I don't need more clients," I said, "But I do want everyone else's clients to be jealous of my clients." With only one 10-person workshop each year I really don't need to advertise, and I am proud of how I treat my friends. If I am going to drag people out of bed in the cold, dark morning I figure it's only right to give them some great coffee to keep them going. From the top of Steptoe we spotted a crop duster, and after we'd had our fill of coffee and sunrise shots, we chased down the little yellow airplane and made an obscene amount of images of it working the young wheat fields. It was a fun way to spend an hour and we ended up shooting crop dusters three times during our trip. Like the summit of Steptoe Butte, shooting low-flying airplanes never gets old. After breakfast back in town we pulled into the hotel for some rest. In the afternoon, we grabbed another batch of picnic dinners and dropped into the town's riverside park for a lecture on composition. These casual lectures by myself and Jeff are a new addition to my workshops. I've always provided some short lessons during my trips, but with our long shooting days in the Palouse, Jeff and I decided to take advantage of the afternoon downtime and give some more substantial lectures. I really enjoyed them. Instead of Steptoe Butte, we drove north to an area of wind turbines for sunset. I had found this spot during my scouting trip to the Palouse a couple of weeks prior to the workshop and I found being underneath the massive turbines a real thrill and a photographic adventure. When we arrived, storm clouds were brewing and we made some great shots of the turbines with angry clouds behind them. The sunset brought a surprise burst of magenta light as a gap opened at the western horizon allowing the sun to blast through. It was incredible. As the sun faded a thunderstorm developed to our east and we set up for some epic shots of lightening behind rows of spinning turbines. It had been a long time since I had the opportunity to shoot a thunderstorm, and I was pumped. Most of us got some great shots of the lightning, and on the way back to Colfax we were treated to some thrilling flashes along the highway and torrential rain. The next day we slept in and hit the road at 6 am. We visited the prettiest barn in the Palouse, which is only a mile outside of Colfax. The historic red barn has been lovingly restored and the owner was nice enough to allow us onto his property to explore it. A convienently-placed old truck provided some great foreground interest and we spent some time working it. The storms from the night before left everything nicely green and clean, and the sky was a constant parade of nice puffy clouds. Pretty much a perfect day for photography. After the barn, we stopped along a back road for some simple compositions of bright green hills before a dynamic blue sky. All of us recall the Microsoft Windows screen wallpaper of the emerald green hills. I'm not positive but I would bet that famous shot was made in the Palouse and we did our level best to better it. Down that same road we found a ghost town in a wooded valley where the only building left is the old brick church. As I whipped up another batch of Stumptown coffee, the group spread out exploring the area. Along with the church there is an old railroad bridge over the Palouse River and some rusting farm equipment hidden in the tall grass. Elberton was a bustling mill town until a flood and a fire (damn!) sent people looking elsewhere for their livelihood. After a mid-day rest we hit the road once more for Steptoe with a detour to Oaksdale to photograph a wonderful old truck on the side of the road. Back atop Steptoe the sunset provided epic side light and everyone filled cards with amazing shots. After it grew dark, I brought out the drone and attached two high-intensity lights. Despite the brisk wind at the summit, I was able to get the drone to fly about with the lights, which gave everyone the opportunity to make some interesting shots of light streaks over the Palouse. The next morning we headed back to Steptoe Butte at 4am for one more sunrise. This one was a winner with warm orange tones and lovely clouds. I made coffee again and once again relished the chance to rub it in with the other photographers shivering in the dawn breeze. At the base of the butte we found our crop duster again and enjoyed some very close passes. We ventured south to Pullman for breakfast, which was amazing thanks to the Danish Abelskivers of the Old European restaurant. I had never had the pleasure of Abelskivers, but they are divine. South of Pullman we photographed a great red barn in the middle of a sea of peas. I flew the drone and had fun buzzing around. In Uniontown we stopped for some surprisingly mediocre coffee from a very pretty coffee shop. After the coffee we stopped at the Art Barn in Uniontown and photographed the wonderful fence made of hundreds of steel wheels of all shapes and sizes. Before heading back to Colfax, we stopped at another amazing barn, this one round, just south of Pullman. Back in Colfax we all collapsed from exhaustion after 12 hours of shooting. The evening brought steady rain so we stayed in town for a leisurely dinner and an early bedtime. The next morning brought blue skies and we loaded up the van and said goodbye to Colfax. We ventured north one more time into the Palouse where we found our crop duster again! This time he was flying right over the road and we made some amazing shots before he radioed down to a friend who drove over to ask us politely to move along. Down the road we found one more charming red barn, this one complete with horses. Jeff used his iPhone and an app that plays horse whinny's (thanks to Nick Page for the tip on that... who knew!). The app worked and brought the horses into the shot. From there we moved on the town of Palouse for coffee and breakfast. With some time to explore Palouse, I found a dusty antique store filled with wonderful light and piles of stuff. Upstairs was an old boarding house and the rooms are now filled with antiques, which made for some great shots. I pushed back our departure time from Palouse so everyone could shoot the store. It was a treasure! We returned to Dayton with a stop to photograph some awesome clouds. Back at the Weinhard Hotel we took over the lobby and I gave a marathon processing lecture. We ate at the Weinhard Cafe, which was terrific, before heading to bed. In the morning we checked out of the hotel and drove to Walla Walla for an epic breakfast. After stuffing ourselves, we bid farewell to Bob and Betty, who drove their own car home to Idaho Falls while we pointed west. The winds rocked the Sprinter as we drove along the Columbia River down to Boardman, where we made a long photo stop at the Boardman Tree Farm. The farm is home to thousands of acres of poplar trees, all in neat rows. We enjoyed the trees knowing with the recent sale of the tree farm that the scenic rows' days are numbered. The entire farm is to be clear-cut and turned into potato fields, which will surely not attract any photographers. Back in Hood River, we stopped for snacks and coffee and a rest from the road. Shortly thereafter we were back in Portland for a farewell dinner. Jeff and I dropped off our friends and headed home, exhausted. Of my many workshops, this one will rank as a favorite. The combination of wonderful people, great photography weather, incredible locations and good coffee made for a very enjoyable week. I am excited to begin planning next year's adventure. Stay tuned!